This one is probably even better than The Matrix in 5 seconds. This upload is a lie!! 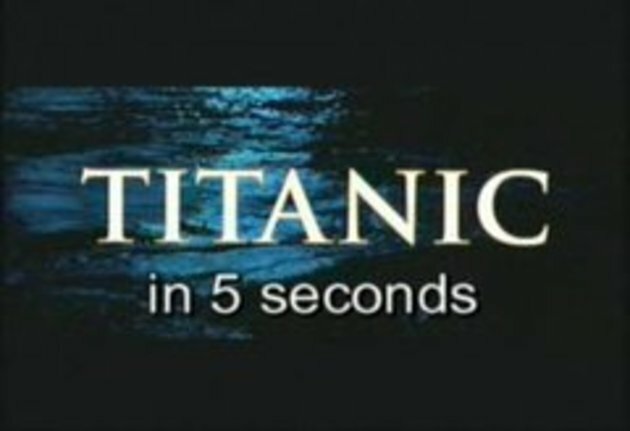 The 11640 sec version of Titanic is the All-Time-Fake-Movie... of all time! If you look closely, you can see wires all over that child size ocean! But this 5 sec is cool! #10 And you just mclove these wires? U see them everywhere. How many vids have u seen wires in? This is the top of my all time films to hate and the worst film ever made. To Top it all it has the worst song ever written, sung and by the 3rd most evil woman on the planet. 5 seconds is to long. well, where was DiCaprio's death - the best moment of whole movie. Think just the same ^^ Perfect !! oh damn.. Again we have a person here who thinks that he's the best comedian on the planet.. That guy with glasses, please go home and never come back. #10 It's...a...fake...movie??? You mean... some movies aren't real? #21: Yes, it was fake, how can you not realise this? The ship had already sunk years before the movie was made and Leonardo DiCaprio is still alive. You are really thick.